Thank you for your interest in Skin Blends. Our professional estheticians research, develop and test every product SkinBlends sells. Skin Blends products are for those who want the healthiest skin possible, so you always look your best. Skin Blends provides excellence and integrity in every phase of our business: products, staffing, service/support, marketing and education. Skin Blends manufactures its products using the strictest standards and highest quality ingrediendts available. Skin Blends estheticians continually review, update and improve product formulas whenever new ingredients or research dictates. Founded in 1999, Skin Blends, LLC continues its mission to provide licensed skin care professionals the most comprehensive and efficient Custom Blending Skin Care System on the market. in 2001, we also began manufacturing MINERAL BLENDS, 100% mineral make up. Today, in addition to training Licensed Skin Care Professionals, we are a major distributor of Cirepil Wax from Paris, and we operate Skin Blends Clinical SPAtique as well as The Advanced Skin Care Training Academy (ASCTA) in Nixa, MO. We are certified and are approved to teach the NCEA curriculum by the National Coalition of Estheticians, Manufacturers/Distributors & Associations. Seeing your Skin Blends Licensed Skin Care Professional for regular facial treatments is the best way to care for your skin. We also recognize not everyone has the time nor means to receive regularly scheduled facial treatments. However, most everyone can make the time to establish a Healthy Skin Care Regimen at home, so we provide an information-packed website, available 24 hours a day, 7 days a week: www.skinblends.com - be sure to click on our NEW and constantly updated online Beauty Boutique. 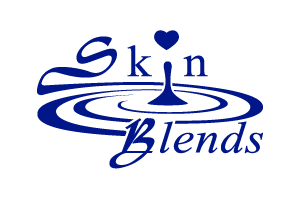 Skin Blends products are ONLY available through Licensed Skin Blends Professionals or directly from Skin Blends. The ONLY authorized seller of Skin Blends products online is skinblends.com. We appreciate and reward referrals to our website. Before we offer Skin Blends products for purchase, each product undergoes clinical testing, where people - not animals - help us determine the perfect formulas. We formulate our results-oriented products using effective, non-irritating ingredients that are gentle enough for sensitive skins. The more you use your Skin Blends products, the happier and healthier your skin will be. Exceptional customer service is an integral part of Skin Blends. We have Licensed Skin Blends Professionals available to answer any questions you might have, and they'll thoroughly explain how and why Skin Blends benefits your skin. Our email updates keep you informed about new products, new formulas, and special offers. We also include educational flyers and sample products with every order. We look forward to helping you achieve your skin care goals.